An artist’s view of Defence Housing Australia’s $61 million Liv Apartment development in Fremantle. Fremantle has been undergoing a quiet transformation in recent years, but a new Defence Housing Australia apartment development project is set to accelerate that steady growth and make Western Australia’s second-largest city a target for property investors who’ve traditionally favoured the larger cities on the Eastern Seaboard. 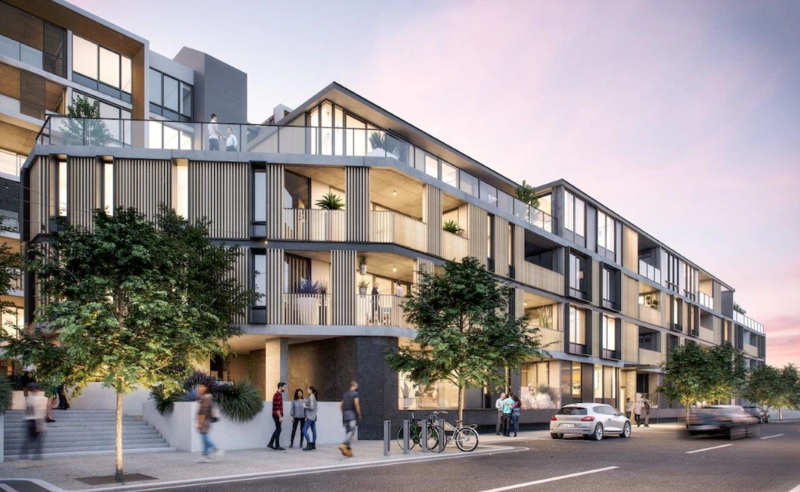 The $61 million development project is one of the biggest in the city to date and will be built on a 1300sqm space in Queen Victoria Street at the location of a former car yard. In addition to 166 units, Liv Apartments will accommodate several commercial tenancies and attract members of the public as well as ADF members. With the city growing steadily, the time is right for a major development to complement Fremantle’s growth, says DHA managing director Jan Mason, “Fremantle has much to offer in terms of amenities — the local pool, fitness centre, art galleries, live music venues, beaches, harbour, museums, cafes and bars — all within walking distance from Liv.”. Along with residential developments such as the DHA’s Liv Apartments, Western Australia’s bustling port city is undergoing a notable transformation with major urban renewal projects, like the Kings Square redevelopment, seeing $1.3 billion earmarked for renewal and redevelopment schemes. “It’s an exciting place to create a new community,” says Ms Mason, who went on to explain that of Liv’s 166 apartments, “59 will be retained for Defence members and 107 will be made available to the public.” The new apartment complex is within 30km of the ADF’s barracks at Irwin and Campbell and is to be completed by next year. One of the big benefits of the project is the creation of new local jobs in Fremantle, with 10 staff members from project builder Georgiou Group employed on-site, along with four labourers and up to 15 apprentices employed directly. “We see local jobs for local people as the first step in creating sustainable communities and great places to live,” said Ms Mason, who also spoke of how new development projects present great opportunities for local businesses. In keeping with the spirit of innovativeness and ushering in change across the City of Fremantle for the benefit of all everyone who calls it home, Liv Apartments will be the first development project in Western Australia to receive an environmental approval rating under the One Planet guidelines. These guidelines, a part of the One Planet Fremantle initiative, are based on the principles of waste reduction and leaving a smaller carbon footprint, principles that seek to create a future in which everyone leads happy and healthy lives while using a fair share of earth’s resources. With innovative projects and initiatives like these gaining popular appeal among its residents and business community, Fremantle’s transformation is certainly shaping up to be very exciting indeed. Livening up a drab living room can be a creative and fun process. Whether you want to do a quick spruce-up or a complete overhaul, transforming your living space does not have to break the bank. There is no easier way to transform the look and feel of your living space than a fresh coat of paint. Whether you are looking for a cozy feel or bold, modern colours, we suggest that you start entirely from scratch. And don’t be afraid to be inventive. Accent walls and attractive colours for doors, windows and skirting boards can really transform a room. Top it off with wall hangings and wall art for an entirely revamped living space. Repainting is a great time to remove everything from your living room. Not only does it make the painting job easier, it can help you gain a fresh perspective and new ideas on how your living room could look. This is especially helpful when planning new furnishings, but can also help you maximize your space and create a new look for your room with your existing furniture. If you are redecorating on a budget you won’t want to entirely refurnish your room, but you can reinvent the look and feel of your existing furniture. Throws and covers can be a great way to transform chairs or sofas, or you could even consider reupholstering. Other items, such as end tables and coffee tables, can be revamped with a coat of paint, while buying smaller items, such as ottomans, can add something new to a room without breaking the bank. Very often living rooms can appear dull because of lack of light. If you do not have a lot of natural light in your living room, there are a number of easy ways to create a brighter feel. Painting your ceiling white is an easy first step, while you might also consider changing your window coverings to let in more natural light. Perimeter lighting, such as standing lamps, can also be an excellent alternative or addition to overhead lighting. If all else fails, you could go for the dark and cosy look instead! The living room is a haven for rest, relaxation and family time, so it should reflect your tastes and personality. While too many knickknacks can make a room look busy, some antiques or other older items that are dear to you can add a lot of personality to a room. It can also be nice to decorate with art or crafts that you or members of your family have created. You could also consider adding a dedicated space for your favourite hobbies, such as a reading nook or a painting space. At Furniture Fitouts, we are committed to providing the highest quality furniture and home decoration solutions. Contact us today to see how we can brighten up your living room. Furnishing a large property may be an expensive undertaking but in other ways it can be much easier than furnishing a small apartment or a single room. With so much space at your disposal, a large property offers a host of possibilities and very little in the way of limitations. A small space, on the other hand, requires careful planning and certain compromises if you are to achieve a pleasing result. In this short article, we are going to take a look at some of the tips and tricks professionals make use of when furnishing less capacious properties. Below is a short list of factors you should bear in mind when furnishing a compact property or room, along with some tips on how to cope with each one. Functionality – When you only have a limited amount of space with which to work, functionality becomes extremely important. This does not mean that you cannot include decorative items in your interior design but you should try to ensure that they are functional too. In the kitchen, for example, you can utilise the space underneath a small breakfast bar to store crockery or other items, rather than just leaving it unused. Dual-purpose furniture, such as sofa beds, is another great idea when furnishing a small property. Creating Separate Areas in One Room – Many small apartments have a single main room that serves as a kitchen, dining room and living area, and sometimes even a bedroom too. If you furnish such a space carelessly, it will end up looking cluttered and confused. The trick to making a studio apartment look stylish is to use pieces of furniture to mark out separate areas: to create distinct living, sleeping, dining and kitchen area without walls. For example: your breakfast bar will naturally separate the kitchen and dining areas and you can place your sofa at the foot of your bed, facing away from it of course, to draw attention to the centre of the living space rather than to the sleeping area. Colour and Its Effect on Space – When decorating and furnishing a compact apartment or house, it is advisable to use light colours that will create a more spacious feeling. Dark colours, unless used sparingly, will have the opposite effect: the walls and furniture will appear to crowd in on you, making you feel cramped and claustrophobic. If you have small children in your home, cream or white sofas and chairs may seem like an impractical choice but if you choose a suite with upholstery that can be easily washed or wiped clean, it could still work well in a family environment. There are, of course, many more tips that you can follow when furnishing a small space but that is all we have room for in this article! If you would like some professional advice on how to furnish your property, or perhaps some help sourcing everything you need, please feel free to get in touch with us at your convenience.